When it became evident in the early morning hours of August 24, 1992, that people in southern Dade County were going to have to do everything possible to protect themselves in their homes, I remembered the mattress. I had read a book by a guy named L.F. Reardon who wrote about his experiences in the 1926 Great Miami Hurricane; how he put his children in the laundry washtub and covered them with a mattress to protect them. So, I said something like: “Friends, here’s what I want you to do. Get a mattress off the bed and have it ready. When you go to your safe spot, get your family in there, get the mattress over them, and wait this thing out.” It was the smartest thing I have ever said in my life. The stories I have heard from people who spent the storm under a mattress still give me chills. We set up in the storage area opposite the set and adjacent to the studio, and at 3:30 am we made our move to what came to be called “the bunker.” I’ve heard the story over and over about how that event motivated people to finally take protective action in their homes. 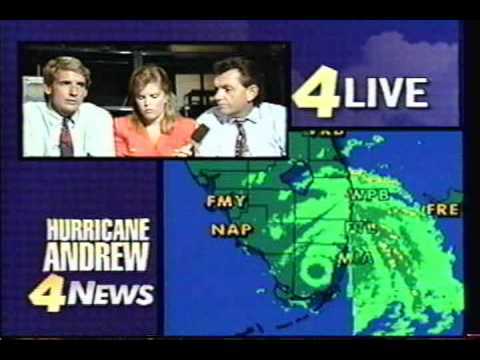 At 4:35 am, we watched the last sweep live on TV as the huge and heavy National Weather Service radar was blown off the roof of the National Hurricane Center. Luckily, we had a backup phone line to the radar in West Palm Beach, so we could still track the storm. Frightened people were calling in as their homes were coming apart. Everyone just wanted to know when it was going to be over. The storm was moving fast, about 20 mph. So the worst of it was there and gone in about 3½ hours. The first reaction of the people in South Dade was stunned disbelief. When they opened their doors or got out from under their mattresses, they found it impossible to comprehend what had happened to their neighborhoods and lives. They said on air that the fact we had not heard from Homestead, Cutler Ridge and points south was NOT good news. This entry was posted in Uncategorized by federalalliance. Bookmark the permalink.